I participated in a campaign on behalf of Mom Central Consulting for Gold Bond. I received product samples and a promotional item as a thank you for participating. Hey there. Summers can be pretty hot here in Southern California. Temperatures regularly hit 90 degrees and that can lead to some pretty sweaty bodies walking around. Even though many of us can hit the beach or walk around an air conditioned mall, many others are stuff inside offices and being sweaty at the work place is just not recommended. See, I work in an office and for the most part, the air conditioner keeps us cool. But there has been times where it breaks down and we are stuck in the sweltering heat. I've gotten into the habit of sprinkling some Gold Bond foot powder spray in my shoes to keep them dry. Last thing I want to have is moist feet where fungus and bacteria can grow. But the problem that I had with the powder is that it's kind of messy. Sometimes I sprinkle too much and it gets all over the rug. Sometimes it gets all over the outside of my shoe so I'll have to spend some time cleaning it up. Well, now I don't have the messy problem anymore. 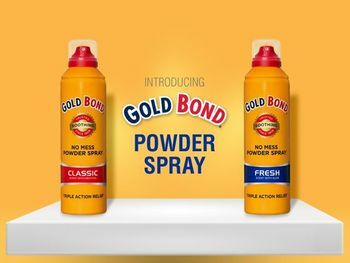 Our good friends at Dad Central and Gold Bond have provided me with the Gold Bond No Mess Powder Spray to try out and let me tell you, this is replacing the standard powder. The Gold Bond No Mess Powder Spray is pretty awesome. Gold Bond has been trusted by many for generations so you know that the no mess spray is going to be of great quality. The nozzle turns 360 degrees so you can spray it in any direction and you can even use the spray can upside down so that you can get those hard to reach areas. You simply hold the can 5 to 6 inches from your body and apply an even spray for a good two seconds or so. That's it! The Gold Bond No Mess Powder Spray deodorizes and cools on contact, will eliminate odors, and absorb wetness. It's hot, you're in your office, working away, when you are called into a meeting. You're a little sweaty and you want to look your best when called in front of you boss. You can't pull out a regular powder spray. It's just too messy. You can try placing some in your hands and then applying to your underarms or body, but now you'll have to run to the restroom to wash your hands. If you had a Gold Bond No Mess Powder Spray with you, you can EASILY spray under your arms and your body and be off to the meeting feeling fresh. Quick, easy, and NO MESS. I keep one in my office drawer for that very reason. I strongly suggest you guys do to. The Gold Bond No Mess Powder Spray is now available at a retail store near you. It comes in the Classic scent or you can get a Fresh Scent to add, well... a fresh scent. lol Honestly, I prefer the classic scent since I already wear cologne. I wouldn't want the scents to be clashing or anything like. Other than the scent, there is absolutely no difference in effectiveness. I used it for the better part of the last two weeks and I think it's a fantastic product. I felt cool, I felt dry, and best of all, I didn't take more than 10 seconds to apply and be on my way. I keep one at home and I keep one at the office. And again, because we live in California, we know that this time of year can be pretty hot so we carry the spray with us to keep the kids cool when were are out and about in the city of Los Angeles. If you live in a hot climate area, do yourself a favor and get this Gold Bond No Mess Powder Spray. You can thank me later! lol Later!